Outrigger Phi Phi Island Resort and Spa is one of Phi Phi Island stop luxury resorts. On the beautiful Loh Bagoa Beach on Phi Phi Don, the raised beachfront bungalow cottages are set amongst the coconut palm plantation overlooking an aquamarine sea. The Outrigger Phi Phi Island Resort and Spa combines the best of a tranquil location, the perfection of the Phi Phi Don landscape and a laid back beach resort atmosphere. The resort also offers wonderful facilities including pools, a dive school, a gym, a spa, a tennis court and some great seafood restaurants as a well as an interesting choice of room type from beachfront to Villa. Loh Bagao beach is a 10 minutes speedboat ride from the main pier at Tonsai Village, the main centre of Phi Phi where the hustle and bustle of travellers, cafes and dive shops all converge. 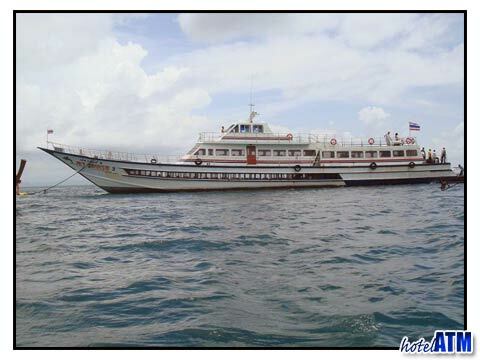 Getting to the Outrigger Phi Phi Island Resort and Spa is straight forward enough as you are met off the Phi Phi ferries from Phuket, Krabi or Koh Lanta and taken by private launch around the island. Similarly you take a speedboat from Phuket for the most direct route for the Phuket International airport Phi Phi transfer. As you arrive at the Outrigger Phi Phi Island Resort and Spa you appreciate it's stunning location. Dominating Loh Bagao beach, the resort is framed by mountains on either side and by limestone cliffs behind. As you skim in over the coral reef the deep sea gives way to a brilliant sandy bottom which runs all the way up to the sea shore. The feeling of space marks the Outrigger Phi Phi Island Resort and Spa out. Here is a resort where you can walk along the beach without stress, where the sea breezes flow through the bungalows uninterrupted and where you find a place to calm your soul. The Outrigger Phi Phi Island Resort and Spa is the primary resort on the beach and the local village covers a small area of the land behind it. There are long walks out to Lanah Bay (15 minutes) and beyond that makes this a paradise lost. The Outrigger Phi Phi Island Resort and Spa Beachfront Junior Suite covers 79 square metres and all you might need for a romantic stay for 2. Beautifully furnished and completely finished these room types are popular with honeymoon couples. The Hillside Pool Villa offers something again. These 110 square metres room types give seclusion and total privacy and sleep 4 people. The Deluxe Garden, Deluxe Bungalow and Superior room types offer great value in one of Thailand's top resorts. The Outrigger Phi Phi Island Resort and Spa has some of the best facilities on Phi Phi Island and this in part is due to the large land area it occupies. The dive school occupies the adventurous souls, the beach front idea for joggers and the tennis is great fun for the sporty. The 2 swimming pools offer play time and maybe a cocktail from the bar, and the Wanna Spa allows you those precious moments of deep relaxation. No self-styled beachfront paradise can do without a seafood restaurant and the menu of full of the freshness of the sea and explosive tastes of Thai cooking. Up to 3rd November 2012 the Outrigger Phi Phi Island Resort and Spa was called Phi Phi Island Village Resort and Spa . When Outrigger Hotels and Resorts Asia Pacific bought the resort they embarked on a serious upgrade of the Beachfront Bungalows and 38 new Deluxe Garden Bungalows (Completed November 2012). The group also oversaw the installation of a new gym.